“Inclusive growth” is something of a buzz term among academics and think tankers in the U.S., and rightly so. The racial wage gap between white and black Americans is currently at its slimmest in Riverside, California — where black households earn 72 cents on every dollar brought home by white households. But inclusive growth in a society that’s historically been, well, not so inclusive, takes more than research. It takes political will and a targeted approach that considers high-skilled trades along with lower-skilled professions and local-serving sectors like hospitality and retail. And so far, most U.S. cities aren’t doing so well. That’s the conclusion of a new Brookings Institution report in which the authors’ Metro Monitor takes stock of the “nation’s 100 largest metropolitan areas along three dimensions: growth, prosperity, and inclusion.” This year’s paper focuses on trends from 2010 to 2015, to measure the effects of the recession and subsequent recovery. The researchers found that all metros studied achieved growth, measured by jobs and output, but inclusive growth? Not so much. Measured one way—by improving the employment rate, median earnings, and relative poverty—only 11 of the 30 metro areas achieved inclusive economic outcomes: Albany, Austin, Charleston, Columbus, Dayton, Denver, Oklahoma City, Omaha, San Antonio, Tulsa, and Worcester. Similarly, only eight (8) of those 30 metro areas managed to improve inclusive economic outcomes for both whites and people of color: Albany, Austin, Charleston, Denver, Des Moines, Houston, Milwaukee, and San Francisco. The upshot, however, is that from 2010 to 2015, four (4) of the nation’s 100 largest metro areas (Albany, Austin, Charleston, Denver) achieved growth, prosperity, and inclusion that benefited a majority of workers of all races and ethnicities. The metros that did manage to achieve inclusive growth tended to have a few things in common. They added “jobs in high-skilled traded sectors like advanced business and professional services, information, and manufacturing at a rate faster than the nation,” according to the authors. But they also saw jobs in lower-paid kinds of work within those sectors. They managed to balance the higher-skilled jobs with well-compensated jobs for middle-skilled workers in industries like construction and healthcare. Finally, they used growth from the other sectors to fuel jobs in lower-paying industries like hospitality and retail. “These patterns indicate a ‘high-road’ economic development strategy that prioritizes both high-skilled, innovative sectors like technology and middle-skill traded sectors like manufacturing and logistics can facilitate inclusive growth,” they write. 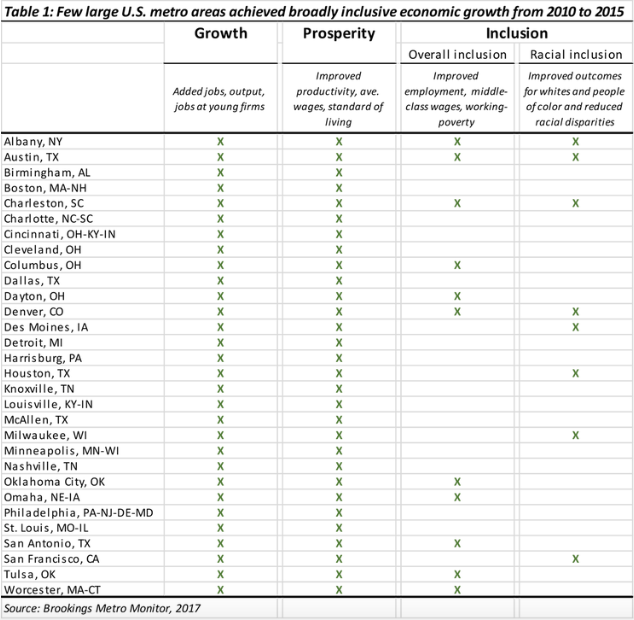 It’s a welcome road map — even though inclusive growth has so far eluded most metros. The National Urban League’s 2017 State of Black America report, released Tuesday, shows that in Riverside, the city with the smallest black-white earning gap over the last year, the number has actually fallen, from 76 cents on the dollar last year to 72 cents this year. In the Twin Cities metro, black households earn only 41 cents for every dollar taken home by white households. And the smallest margin for Hispanic-white households is still about 12 cents (in Modesto, California). In many metros, it’s between 40 and 60 cents.